Let's just dive right in to the nitty gritty. When I tell people what I do for a living they look at me in disbelief. They really cannot fathom that I work my own schedule, from the comfort of my home, or at the beach or wherever I am that day and earn a living doing it. I get the same reaction every time, they look at me in a quizzical kind of way, tilt their head and say "oh wow, how do you do that?". So, I'm creating a kit, because I want to help others like me who were struggling wondering how can I build a truly successful website. You will definitely feel confident moving forward with my tips, tricks and information, it won't be long and you'll feel like an expert, with my guide at your side. And you don't have to tell anyone you learned it in my guide, that will be just between you and me! The most frequently asked question I get is "how do you start a successful website or blog"? as well as, "what technical information do you need to know"? So... 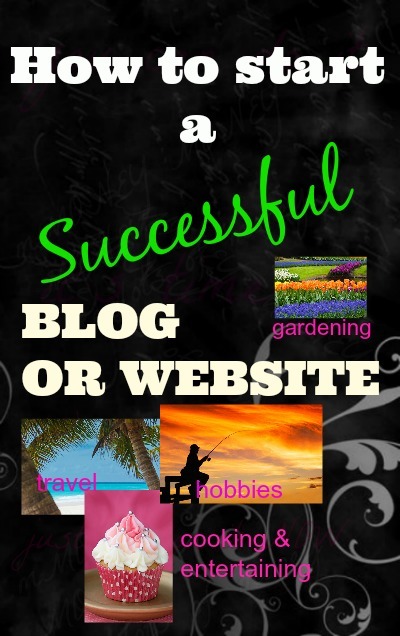 I'm creating a tell all about how to create a successful website or blog. I started in 2006 and since then I've learned so many different aspects as to things that make a huge difference in creating traffic and income. I put the information I learned to the trial and error process, making tweeks and more tweeks and through lots of heartaches until I had a successful formula that worked for building a successful site that gets the results I want. You can benefit from all that I've learned and experimented with, without the heartaches and wanting to give up. I am confident that you can become an expert at understanding how to build a successful website or blog in a much shorter time than I did using my tips and knowledge base that I'll be sharing with you in my kit. I'll be sharing all of my secrets I've learned over the past several years, I'll not be holding anything back. My kit will include all of the details you will need to finally dive into creating a sustainable and growing website that creates passive income (income that you make from advertisers like Adsense and Amazon, or Ebay if you have your own gorgeous creations) . If you are looking for a quick get rich scheme ~ this is not for you. This is for those who are willing to make a commitment to doing the work. But... my guide will show you where to avoid the pitfalls ~ these are my secrets and the true value that is priceless. And in time you can have enough income to retire from your regular job, and if one site isn't enough income for you you can create multiple websites or blogs as many blog and website owners do. I myself have plans for a new website I'm so excited about starting, because once you have a successful formula you can duplicate it over and over, and that's what I'm going to do. My guide is for those who want to make something they can be proud of and watch it grow. This is perfect for the stay at home mom, or a retiree who wants more income, both can earn significant income if they put in the time and effort. Here's how I look at it, building a website is like making an investment, but instead of investing money I am investing my time, the only money I've invested is on my website host, and it's very inexpensive, and I'll be sharing that information with you too. That's something I can live with, and something I can stay excited about. How much money will you make? It all depends on the topic referred to as a "niche" that you choose, every niche is different and different strategies are needed for the different niches. What I can tell you is that most websites will earn approximately $1500. a month by the end of the first year, it could be more or less depending upon how much work you put into it and how much your niche can earn per advertisers click via your ads, and if you have any products you can sell yourself, etc. ~ But we'll get deep into this topic in the guide, and I'll give you some examples. My goal is to earn as much money as possible, and I'm sure that's the goal with most of you too. My guide will be released as soon as I have it completed, I am still in the process of creating it. I want to focus on creating the very best guide possible, and not rush it. ~ But it should be ready in the next few months ~ early 2015. Until then, let your enthusiasm grow and grow, so that when you start you will be super~charged to get started. Are you on my mailing list yet? If not sign up here and I'll let you know when the guide is ready.